Dexter Daze was known as “Sidewalk Days” and local merchants displayed their goods for purchase on the sidewalk in front of their businesses. Elaine Owsley and Nancy McLeod began chairing the first “Discover Dexter Days” for the Dexter Chamber of Commerce. The event was held on August 4 & 5, and activities included old-time movies, a pie-baking contest, square dancing, a parade and much more. 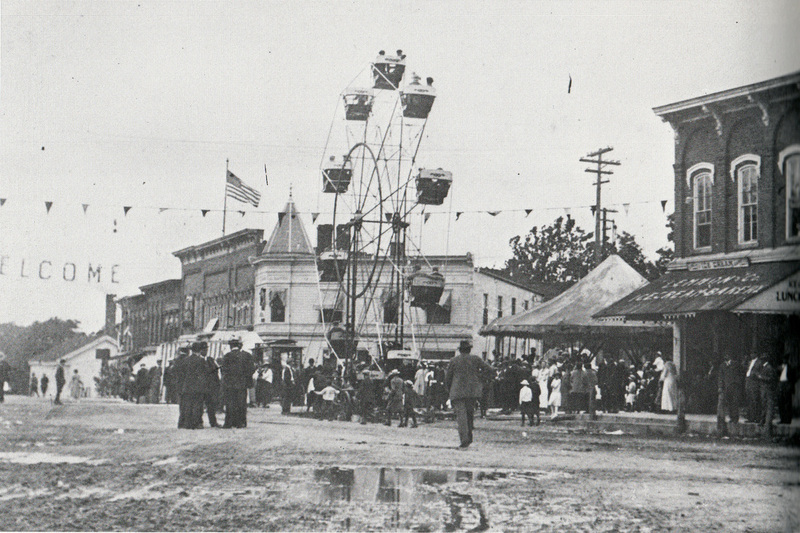 1914 Ferris Wheel in Old Dexter Village. Prepared for Village of Dexter by Hazel Proctor and Ann Arbor Federal Savings, 1973. “Dexter's Sesquicentennial” replaced “Discover Dexter Days” and the festival greatly enlarged. This was also the year when discussions emerged about “Days or Daze”. “Dexter Daze” has occurred every year. Enthusiasm, as well as community growth, has developed an event that includes over 100 booths of artisans and crafters, free entertainment for the whole family, and a sense of “community” with people knowing and caring for their neighbors.